I’m watching Coco Before Chanel right now…can I be French, please? So stylish. Today didn’t turn out quite as I had planned because it was so hot! I got all the way outside in my tights and leather boots and turned around and came back inside. I ended up wearing the Gianni Bini loafers, J. Crew Minnie pants, J. 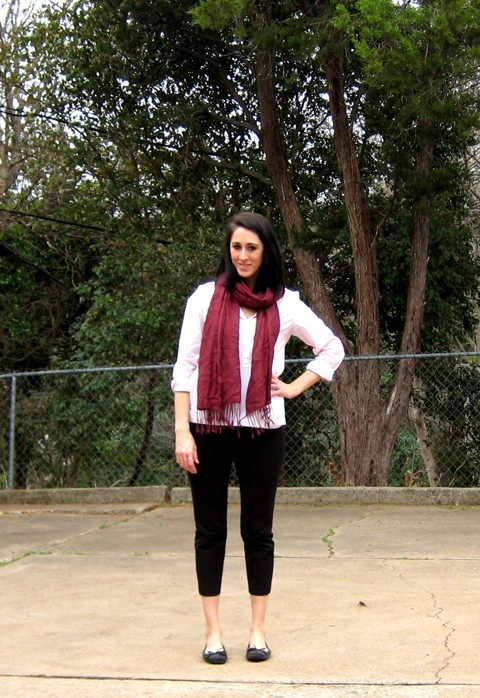 Crew striped tunic, and a maroon scarf. I felt very Audrey Hepburn and comfy all day, which was perfect for a board meeting and walking back and forth between two buildings a bunch. My camera is still acting funky, which I’m a little worried about, but I was able to get a decent shot this morning.